LiveCode LessonsLiveCode LessonsHow To - LiveCode Mobile Tasks iOS TasksHow do I Create a Distribution Profile for iOS? This lesson describes how to set up a distribution profile that can be used for applications built with LiveCode. It is assumed that you have signed up to the iOS Apple Developer Program. Screen captures are provided. 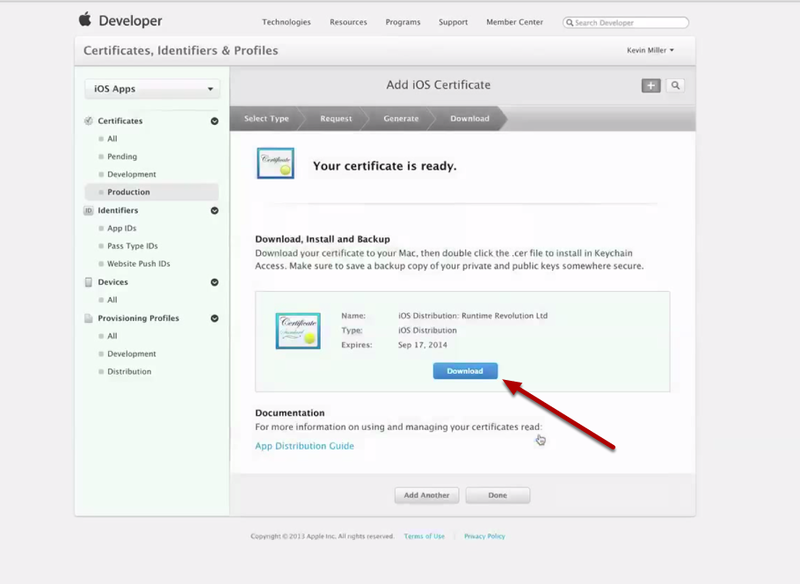 A distribution profile is required if want to release your iOS application through the online Apple store. The information discussed here is reduced and is also covered on the apple iOS Provisioning Portal website. You can access that additional information by logging into the iOS provisioning portal that is accessible from: https://developer.apple.com/. Select the Member Center and use your login credentials to log into your account. Depending if you are a developer for Mac apps and/or iOS apps your login screen may differ. You may have to follow a link to the iOS Dev Center. Then follow the link to the iOS Provisioning Portal. 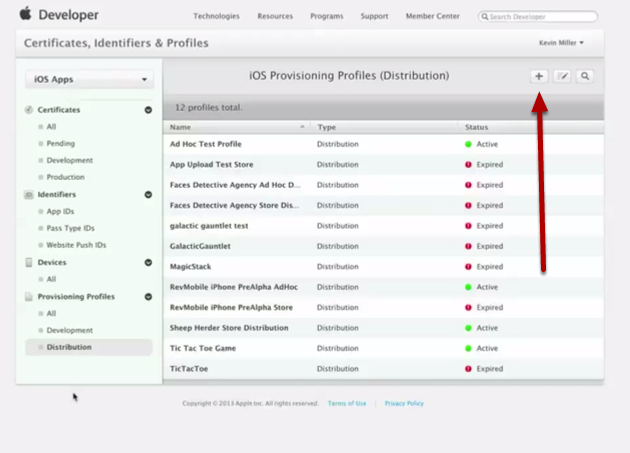 The iOS Provisioning Portal provides you with a link to Distribution. Select the Prepare App tab and select the highlighted headings in order to expand the steps provided by Apple. 2. Select App Store as the Distribution Method. 3. Enter the Profile name. 4. Ensure that your Distribution Certificate has been created and is displayed correctly. 7. Select the Download button from next to the Distribution Provisioning Profile you created. 8. Double click the .mobileprovision install the Distribution Provisioning Profile on your computer. You are now ready to move on to lesson: How do I set up an App for Submission to iTunes Connect? Next: How do I Create a Development Profile for iOS? I'm nto sure why this post isn't being commented on by more people. It's Fantastic! This is the only place I've found step by step instructions so clearly laid out. If I have the certificates downloaded and then want to create the key how do you link the two things together? or do I have to revoke it and start fresh. I did not create the original certificate, my developer did. if your developer created the certificate, then he should also have the keys. You could ask him for the keys. 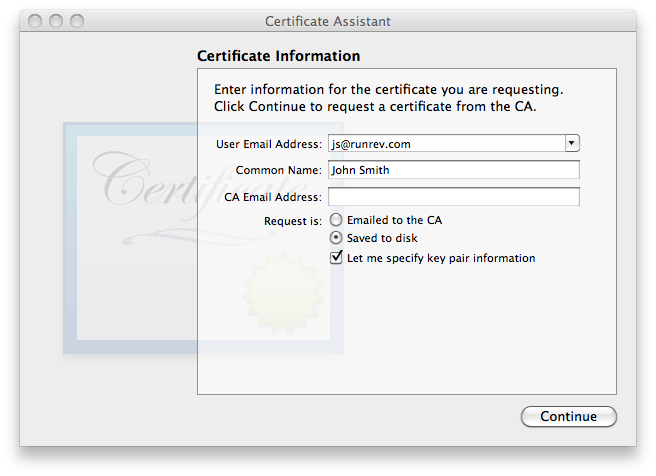 Step: "Backing up your Certificates" provides the information you need for backing the keys up. I've got the distribution certificate but there are no keys associated with it. Without those keys the Organizer is complaining about linkage. What to do? 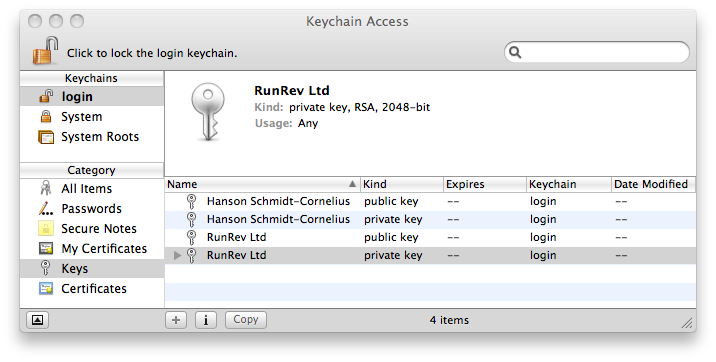 your keys are generated using the Keychain Access Utility on your Mac. If you have a distribution certificate then the keys to generate it would have been created too. The iOS Developers portal provides more details and up to date information on this topic than is captured in this lesson. So this explains how to set up distribution through iTunes. Is there a way to distribute apps made with LiveCode to iOS users without using iTunes? For example, if a client wants an app to be used only internally by their team, and not be available to the public. Is this possible? yes, it is possible. Your client can register as an iOS developer and create a team provisioning profile that has a number of devices associated with it. Instructions on how to do so are provided in the iOS Provisioning Portal. The lesson "How do I Become an iOS developer": http://lessons.runrev.com/s/lessons/m/4069/l/23275 should be a starting point, but you will have to delve into the documentation from Apple. very clear instructions for this process, which is not the case on the myriad of sites claiming to cover this topic ! Thank you. But I want to install existing certificates on a new mac system where no certificates have been installed before. Can you please let me know steps for it?